The Japanese have a real passion for food. More and more, this passion is spreading to all parts of the world. 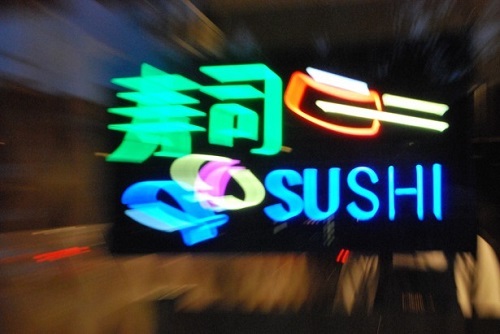 Most major cities around the world have sushi bars and restaurants. In some places, such as New York, they are practically on every corner. The popularity of Japanese cuisine could be partly due to the fact that, more than most any other national cuisine, it is considered an art form, where presentation, esthetic and ritual are as much a part of the dining experience as the taste of the food. 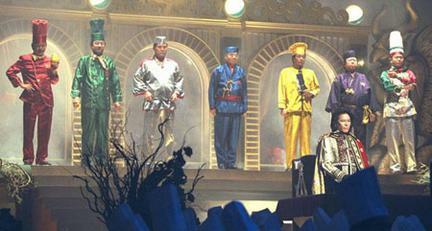 Popular shows such as Iron Chef have familiarized television audiences with the unique ingredients, methods, culture and history of Japanese cuisine. 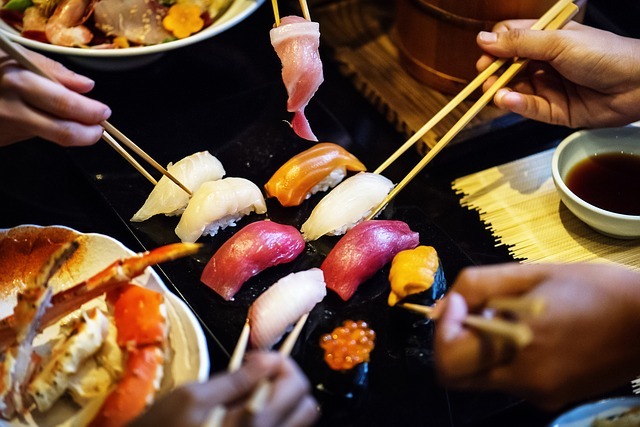 The Japanese passion for food is also evidenced by the fact that nearly every city, town or district has their own culinary specialty for which they are known. There is also a matter of regional taste, where the palates of the east coast favor bolder flavors as contrasted with the more delicate flavors of the west coast. Much attention is payed to the combining and balancing of the taste elements, bitter, sour, sweet, hot, salty and delicate. Further more ingredients are categorized into five color groups, demonstrating that the look of the food is also of great importance. 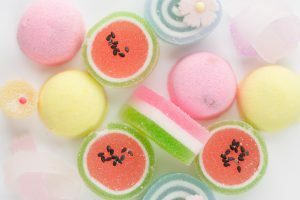 Sweets and sushi are examples of Japanese food as art. Early influences in Japanese food came from the mainland. Rice was introduced from China, along with soy ingredients and the use of chopsticks. Rice cultivation began around 300 BC and grew in importance over time until half of all farmland was being used for growing rice. The introduction of Buddhism to Japan resulted in a ban on meat in AD 700 and signaled the rise of sushi. It was not until around the 1880’s that meat reclaimed its place in Japanese cuisine. The 20th century saw the introduction of western food items such as bread, coffee and ice cream. Although many of these ingredients and influences were not originally Japanese, Japan developed its own unique cooking styles and preparations. Rice, for example, is always served in its own bowl surrounded by various sides on individual plates. Typical flavors and ingredients include dashi, which begins as skipjack tuna, simmered, smoked, dried and shaved, then used to make a fish stock or broth, soy sauce, sake (rice wine), mirin, a low alcohol rice wine, vinegar, sugar, salt and ginger. Miso, a fermented soybean paste, wasabi, made from the grated root of the rare wasabi plant (more common and cheaper versions are based on horseradish), and sesame are also used as flavorings for sauces and marinades. Togarashi is a spice blend consisting of chile, orange peel, sesame seeds, seaweed, hemp seeds, Japanese pepper and poppy seeds. Bamboo shoots and pickled vegetables and ginger are also incorporated in various ways. Red bean paste and green tea – in particular, the matcha green tea powder, popular in tea ceremonies- are both commonly found in desserts, including ice cream. Umeboshi are fruits, such as apricots or prunes, that are sundried and cured with brine. Shiokara is a salted and fermented fish specialty commonly made from the guts of squid or cuttlefish, although sardines or mackerel can also be used. Yuba is made from air drying the skin formed from cooking soymilk. The list of Japanese specialty ingredients is quite extensive, including specialty herbs, spices, fruits, plants and fish products. 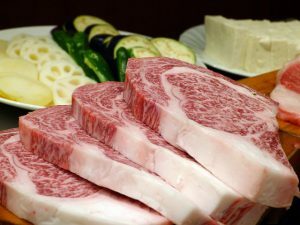 Kobe or Wagyu beef is a very expensive type of beef of beef cattle, raised on a special diet which results in a marbled steak that is sensational. Sushi and sashimi are popular the world over nowadays. 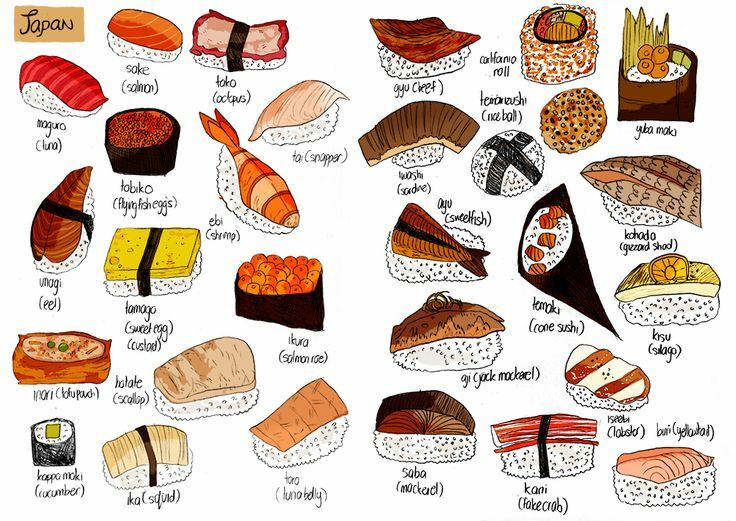 Sushi consists of vinegared rice formed into a ball and topped with or rolled with raw fish, vegetables or a variety of other ingredients. Sashimi designated thinly sliced raw fish, or sometimes meat. Sukiyaki is usually prepared tableside and consists of meat and vegetables slowly cooked or simmered. Teriyaki, on the other hand, is broiled or grilled. Soy sauce, mirin and sugar provide the flavor and shimmery glaze. Tempura refers to battered and deep fried items, usually including prawns, fish and vegetables. Yakitori refers to skewered and grilled items. Originally made with chicken and vegetables, yakitori can also be made with pork, beef or fish. 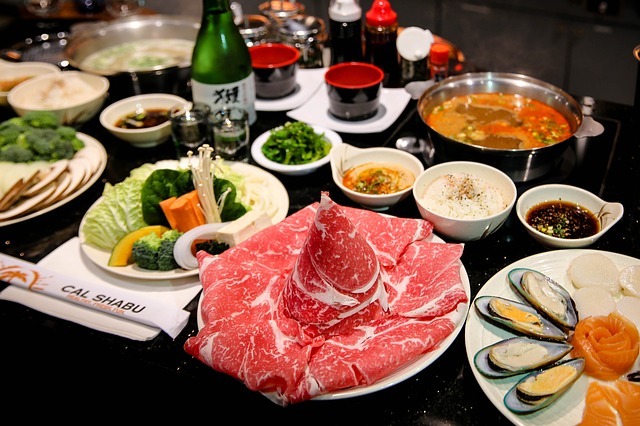 Shabu shabu is fondue style. 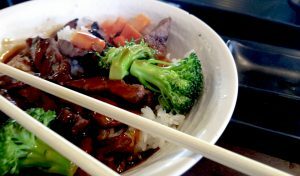 Thinly sliced beef, or other items are cooked in a pot of boiling water then dipped in a sauce. Tonkatsu is a deep-fried pork fillet or cutlet. 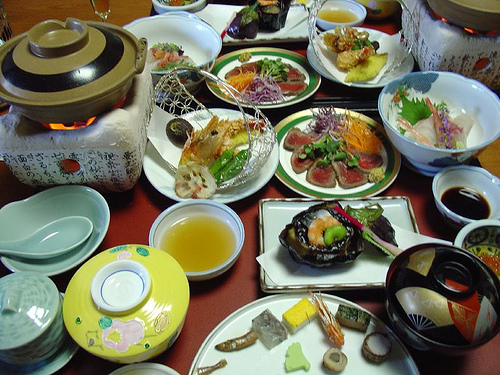 Kaiseki ryori refers to the traditional multi-course meal consisting of many small dishes. There is a prescribed order to the dishes and traditional techniques are used, but the dishes may vary by season or region. Noodles are also a common part of a Japanese meal. 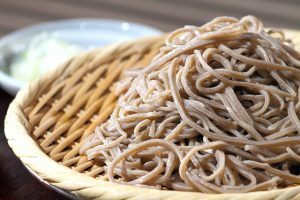 The two most common types are soba, made from buckwheat flour, and udon, a wheat flour noodle. Ramen is also common. Noodles are served as part of a soup bowl containing ingredients such as pork, green onion, seaweed and egg. 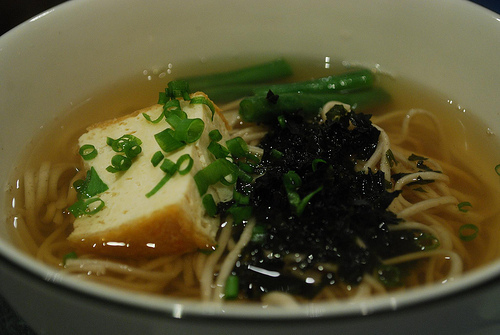 Miso soup is made from miso paste and fish stock and often contains vegetables, tofu or seafood. Wagashi are sweets made from ingredients such as fruit, plants, rice and bean paste. There are a huge variety of shapes and types and they are truly an art form. The tea ceremony revolves around Japan’s ‘national beverage’, green tea. The ground tea leaf powder called matcha is prepared with special utensils and served in tea bowls with much ceremony and attention to detail. A tea ceremony can be short and relatively informal (chakai) or involve an elaborate kaiseki meal, which can last as long as four hours. Sake is one of Japan’s more famous alcoholic drinks. It is made from polished, fermented rice. 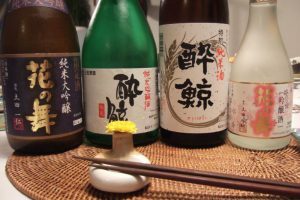 The different types or versions of sake include clear, cloudy, aged, sparkling or unfiltered. Shōchu is a beverage made from barley, sweet potato, buckwheat or rice. In recent years, the Japanese have become known for their excellent beers, such as Sapporo, Kirin or Asahi. 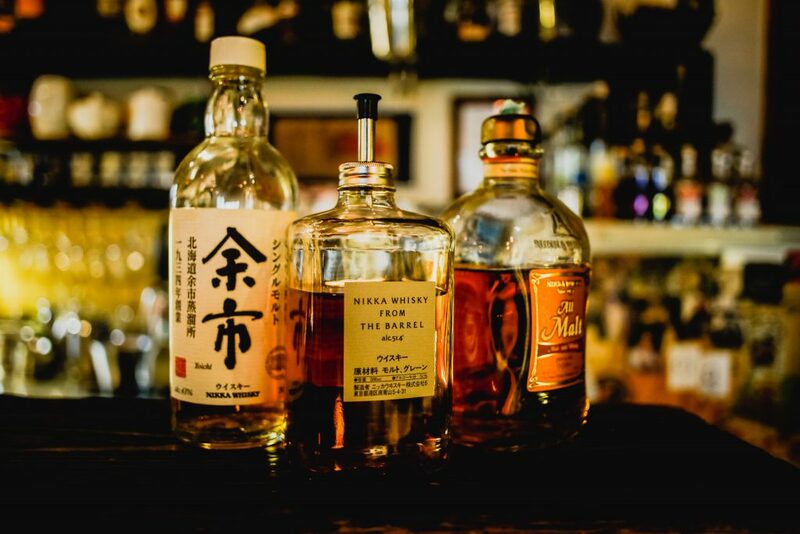 Even more recently, Japan has become noted for producing whisky. Although production began as long ago as 1870, Japanese whisky didn’t gain a worldwide reputation until the first decade of this century. Among the best are whiskies made by Nikka and Suntory, but there are numerous others worth trying. 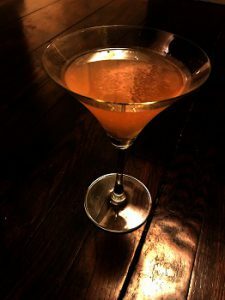 This month’s cocktail is the Sakura Special. The flavors of gin, ginger and grapefruit combine with sparkling sake to create a delicious celebratory drink. Combine all ingredients except sake with ice and shake. Strain and pour into cocktail glass and top with 2 oz. sparkling sake or to taste.